Hours before Donald Trump accepted the Republican nomination for president, Bucks Commissioner Rob Loughery finished up a meeting with Indiana Gov. Mike Pence. Pence, who was tapped by Trump to run for vice president, spoke to the Pennsylvania delegation over breakfast at the Republican National Convention in Cleveland. The takeaway for Loughery, who was representing the 8th District, was the importance of his home state for the outcome of November’s election. Loughery was an early supporter of Florida Sen. Marco Rubio’s campaign. In the primary, he voted for Ohio Gov. John Kasich. Loughery said all along that his role as a delegate was to support what the people of the 8th District wanted at the convention. It turns out, they wanted Donald Trump. Loughery was a Pennsylvania delegate at the 2012 RNC in Tampa, Florida. Though the structure and flow of the Cleveland convention was the same, the energy was different, he said. “It’ll peak tonight with Donald Trump,” he added. That night, the Republican nominee took the stage at around 10:30 p.m, and began what would be a 75-minute speech touching on a range of topics, with a special emphasis on national security and law and order. Worthington is the owner of the Newtown Athletic Club and a first-time delegate. Both delegates, in reflecting on the convention, pointed to a pivotal moment that galvanized Republican support for Trump: Ted Cruz’s refusal to endorse him. 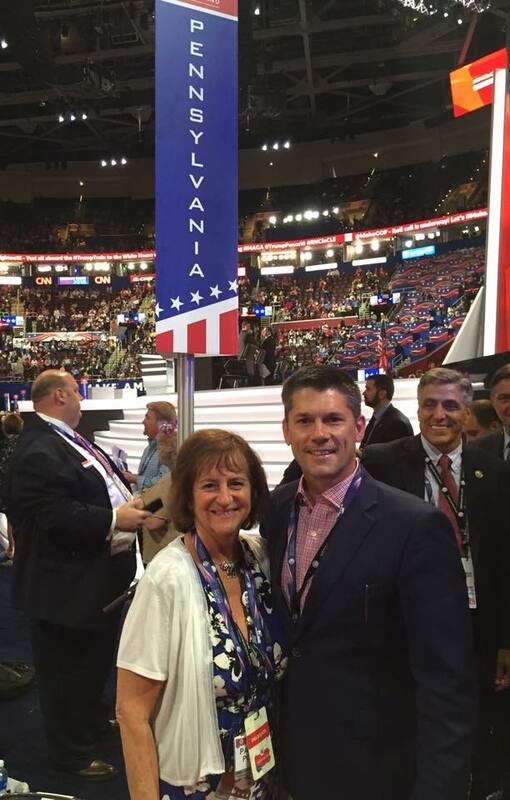 Photo courtesy of Jim Worthington – Bucks delegate Jim Worthington at the Republican National Convention. “The crowd just went ballistic,” Worthington said. Boos rained down on the Texas senator as he asked voters to “stand and speak and vote your conscience,” on election day. It was viewed as a Trump snub by most observers. “The more people who are unified, it brings excitement and energy,” he added. Moving forward from the convention, there will be plenty of that in Bucks County. On the morning following the convention, Worthington was already prepared to return home and continue campaigning for Trump. By the end of this week, he expects 2,500 more lawn signs to be distributed in Bucks as the Democratic National Convention gets underway down the road in Philadelphia.